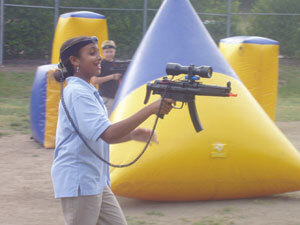 About Us - The Latest Innovation In Outdoor Laser Tag Equipment Take Advantage Of Our 14 Day Trial Program! The founder of Ikon-x has over twenty five years of business experience. He is what you would call a quintessential entrepreneur owning numerous businesses including vending machines, restaurants, pressure washers, indoor and outdoor paintball fields and for the last thirteen years - outdoor laser tag. Each new venture was always a success, not one failure to date. All businesses were sold for significant profits after running them for many years. But of all his business ventures, outdoor laser tag is by far the most exciting. It is a highly profitable growing industry that is still in its infancy. Anyone who gets in at this point in time can ride on the wave to success. Initially he looked into the indoor laser tag arena but soon realized it was too expensive and too limited. Not only was the software, guns, vests and other necessary equipment outrageously over priced but rent on an indoor location was so incredibly high it was entirely impractical to pay month after month, eating into the profits greatly. Besides, the laser tag guns wouldn't work outdoors beyond ten feet. That is when he decided to create his own outdoor laser tag units at an affordable price (the Ikon-x) and start his own mobile laser tag business (Laser Tag USA). With over thirteen years of real world applications the Ikon-x is a bonafide solution for the outdoor laser tag business. We provide top-notch Outdoor Laser Tag Guns, great customer support, and prices that can't be beat! Through our commitment, experience, and expertise Ikon-x has established a business relationship with our customers that will last a lifetime!